On our honeymoon, we will venture out into an unforgettable adventure with our Island Excursion. We will sail out from Koh Samui and explore a nearby island, taking in the beautiful views and learning about a new and wonderful tropical culture. 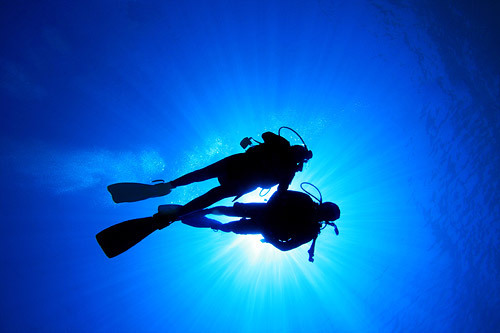 Diving is the ultimate excursion for our honeymoon. We will travel to Sail Rock and dive into the depths of the crystal clear azure waters, taking in the vast wildlife around us and admiring all that the Gulf of Thailand has to offer. We will travel and explore the island of Koh Samui on our honeymoon. We will set out from the resort and be guided with our own personal tour guide to the best that Koh Samui has to offer us. Gaining a deeper understanding of another culture, this will be an exciting adventure for us to enjoy while on our honeymoon. 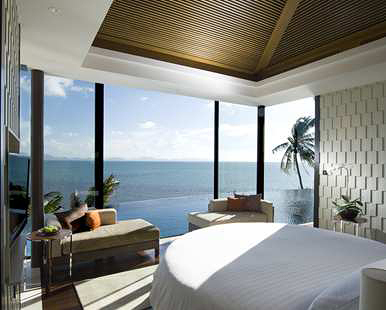 Complete with a 10-meter infinity-edge pool, our elegant One Bedroom Oceanview Pool Villa offers us spectacular views of the Gulf of Thailand and the majestic sunsets over the fabled “Five Islands” of Koh Samui. Our space provides quality furnishings, designer interiors and is connected with in-room technology featuring next generation Apple TV based computer systems IPTV, and complimentary Internet access. Our stylishly appointed bathroom comes with a rain shower, oversized soaking tub and spa-quality amenity collection that puts the finishing touches to one of the most luxurious villa products in all of Thailand. Our luxurious freestanding One Bedroom Water Front Pool Villa is set close to the calming waters and romantic sounds of the Gulf of Thailand. Offering the majestic sunsets over the fabled “Five Islands” of Koh Samui, our villa is complemented by quality furnishings and designer interiors and comes with classic amenities such as wireless internet. The sumptuous marble bathroom offers us spa-quality amenities including an oversized soak tub, glass-walled rain shower and twin vanity sets. Our One Bedroom Oceanfront Retreat Pool Villa offers us commanding views of the Gulf of Thailand coupled with complete privacy. 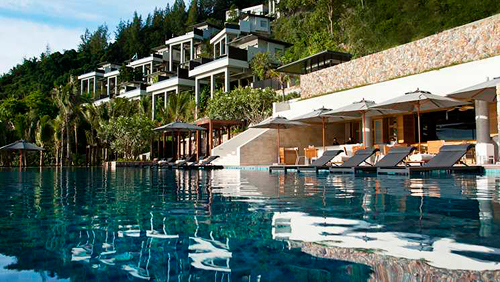 Here, we will enjoy the state-of-the-art in-villa technology including an iPad, Bose Stereo surround sound systems, Apple TV based computer systems IPTV, Ipad and complimentary internet access offered throughout the resort. Our large walk-in closet is equipped with board games and fully stocked mini-bar, and the espresso machine provides us with the finishing touches to the villa. The sumptuous marble bathroom is fitted with premium, spa-quality amenities including an oversized soaking tub, glass-walled rain shower, separate water closet and twin vanity sets for the ultimate honeymoon experience. We will experience the very best of tropical resort living in our Conrad Royal Oceanview Pool Villa, the premium suite at Conrad Koh Samui and arguably one of the finest luxury villas on the island. 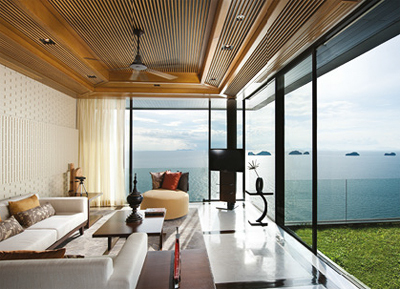 Discreetly situated at the edge of the resort, our luxury villa offers us not only absolute privacy but also the most incredible views of the Gulf of Thailand. A private stone pathway leads us to lush, landscaped gardens as they wind up towards our tranquil, two-story contemporary Thai style villa. Opening onto a stylish foyer, the villa features a manicured viewing lawn and a 22.5-meter-long infinity-edge pool, which stretches the length of the villa and seemingly into the azure sea and beyond. An expansive living space awaits us, complete with designer furniture and quality fittings. At night, we will enjoy the luxury of our master suite where we will recline on the oversized circular bed facing the spectacular vista of the sea. We will also soak in the spa-quality oversized tub while savoring magnificent sea views or soothe our bodies with a raindrop shower. Complete with an expansive decking area, sunken dinner table, and lounge chairs, this space is the perfect accommodation for our honeymoon. This elegant two-bedroom villa is set over two levels, offering the perfect space for us to share the ultimate honeymoon experience. Inspiring details in natural tone, contemporary Thai-inspired motifs, tropical wood furnishings and designer furniture combine to make each of these villas as oasis of luxury. The upper floor entrance opens onto an emerald lawn compete with a seating area from which we will view the Azure sea vistas. A large open foyer encompasses a living room with a comprehensive entertainment system, powder room, a fully equipped kitchenette and a dining area for stylish gatherings. 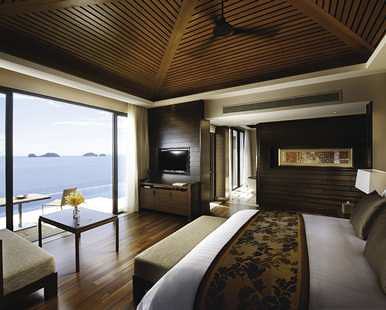 A master suite and junior suite, private 12m infinity-edge pool and outdoor deck are located on the lower level. The master bedroom features a luxurious marble bathroom with spa-quality amenities including an oversized soak tub, glass-walled rain shower, and twin vanity sinks. We will enjoy ocean views from each bedroom through floor-to-ceiling windows that open onto an elegant private wooden deck area with cushioned lounge chairs for an exclusive and unforgettable luxury experience. This honeymoon haven welcomes us to a breathtaking panorama of sea, sun and sky. This magnificent villa offers the finest in resort living. Tropical motifs are combined with subtle Thai influences and contemporary design to create a unique décor featuring rich tones and natural textures. 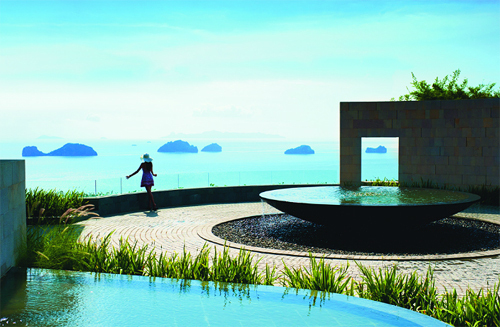 The upper level entrance opens to a private outdoor lawn terrace, ideal for relaxing for pre-dinner cocktails while taking in panoramic sea views and exquisite Samui sunsets. This level also includes an open-plan living and dining area, contemporary bar, private kitchen and a spacious sun deck with an area for al-fresco dining. 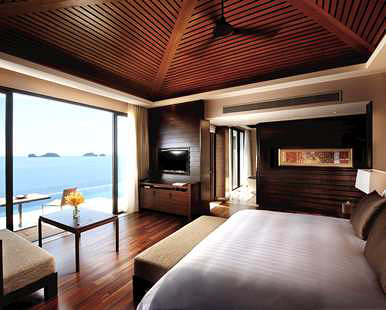 The master suite, two junior suites, private pool and outdoor deck are located on the lower level. The master suite boasts its own living area with a 42-inch plasma TV, a stylish circular bed, private study, and a walk-in closet. The adjoining bathroom is a masterpiece on its own, featuring a sunken circular tub, outdoor shower, and whirlpool and plunge pool. Two junior suites, complete with king size beds, open directly onto the large pool terrace. 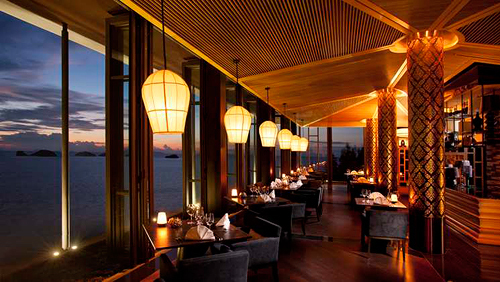 We will treat ourselves to a culinary journey through contemporary Thai cuisine in a luxury environment at Jahn, Conrad Koh Samui’s culinary crown jewel. At this restaurant, expert chefs use a blend of traditional Thai cooking techniques and specially imported international ingredients to create memorable signature dishes. This exclusive candle-lit dining room for up to 28 guests provides a stunning view of the moonlit resort and overlooks the Gulf of Thailand. We will gaze out of the floor-to-ceiling windows to watch the sun sinking slowly over the glittering ocean while sipping on one of the superb vintage wines chosen with care by the professional sommelier and dining on delicious delicacies at Jahn. 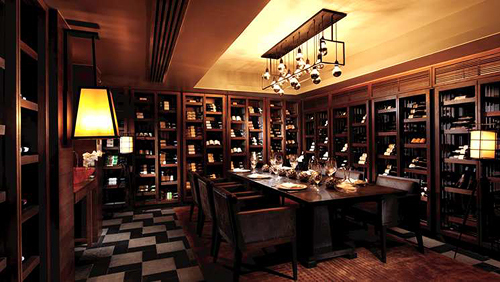 The Cellar is the resort’s premier private wine cellar. Featuring over 3,000 vintages, this venue is ideal for intimate gatherings, unique celebrations and interactive wine-tasting evenings. Located at the highest point in the resort, we will enter this atmospheric room through a large wooden door and will be met with an imposing table lined with specialty bottles and a variety of original artwork. The executive chef and sommelier have worked together to produce carefully selected, complementary menus, making The Cellar an exclusive destination for memorable culinary experiences and interactive wine sessions on our honeymoon. We will enjoy vibrant flavors in a dynamic atmosphere in Conrad’s smart and casual all-day restaurant, Zest, which features both indoor seating options and outdoor dining to allow us to enjoy Mediterranean specialties and sublime ocean views alfresco. The Food Library, a specially commissioned refrigerated display, showcases artistically prepared ingredients that are then incorporated into tempting dishes by the expert chefs. Set next to an infinity pool and surrounded by beautifully landscaped gardens, the relaxed, open-air Azure Bar and Grill is perfect for us on our honeymoon. At twilight, a magical transformation occurs when the music and lighting changes to reflect the colorful evening skies, making for a sophisticated yet relaxing ambiance that seamlessly glides from happy hour to dinner. We will anticipate a savory dish paired with excellent wines and all-night stargazing at this wonderful restaurant. 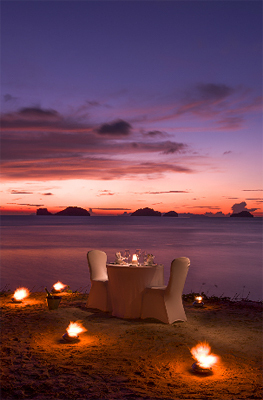 Our honeymoon at Conrad Koh Samui will be enhanced with a romantic dinner for two on the beach. 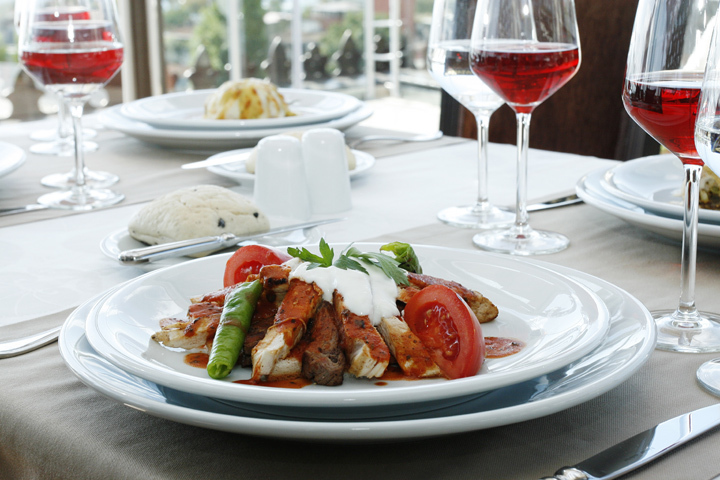 In a secluded setting on a private beach, we will indulge in a tantalizing 3-course dinner with a glass of wine. As the waves gently crash onto shore, we will admire the twinkling stars above while creating unforgettable memories drenched in intimacy and tropical elegance. Aura Lounge is the ultimate destination at the Conrad Koh Samui to enjoy spectacular sunset views over the golden waters of the Gulf of Thailand. 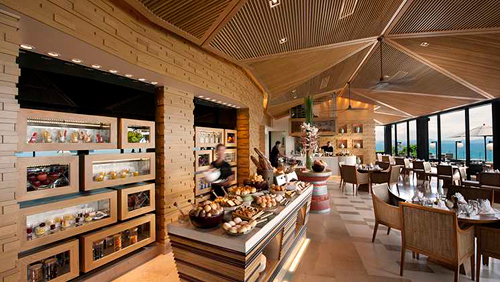 At this exclusive setting, perched high above the resort against a large rock wall, Aura Lounge serves premium spirits, delicious cocktails and superb vintages. While we sit by the dramatic open-flame pits and gaze out at the sunset, we will toast our new lives together in complete sophistication. 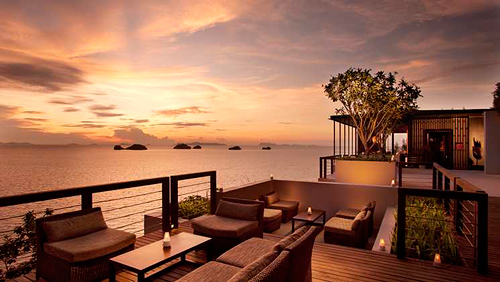 With your generous gift, we will celebrate our honeymoon at the beautiful island resort, Conrad Koh Samui, Thailand. Here, we will relax in an idyllic surrounding that contains four amazing restaurants, a private cellar containing more than 3,000 vintages, and an indulgent spa. 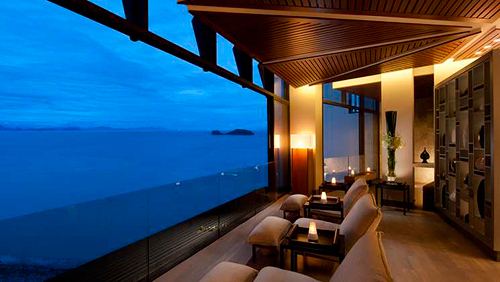 At night, we will dine at Jahn, one of the resort’s four exquisite restaurants. Expert chefs combine the finest imported ingredients and traditional Thai cooking techniques to create memorable pan-Asian signature dishes. Whether we choose to exercise on the outdoor wooden yoga deck, sunbathe on the beach, or explore the nearby Fisherman’s Village in Bophut to gain a sense of the island’s cultural heritage, our honeymoon at Conrad Koh Samui is bound to be unforgettable. 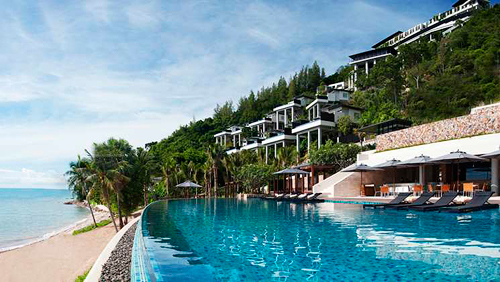 The Conrad Koh Samui is the ideal resort for our honeymoon. Here, we will stay in a luxury One Bedroom villa with a private terrace that overlooks the Gulf of Thailand and swim in our private 10-meter pool. We will indulge in a personalized holistic treatment at the resort’s two-story luxury spa, where each spa treatment room has its own private deck with a beautiful view of the sea. Easily accessible from Bangkok Suvanarbuhmi Airport, Koh Samui is an idyllic tropical island, with soft white beaches, lush jungles, and miles of beautiful azure sea. 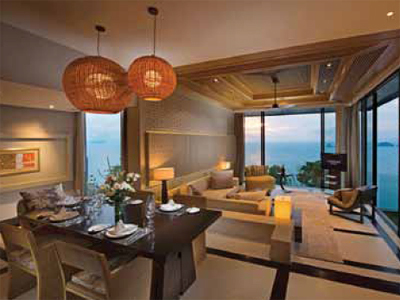 Your thoughtful contribution allows us to experience the best of Thailand luxury on our honeymoon. A bottle of our favorite wine will be delivered to our suite. We will make a toast to our romantic honeymoon in paradise while taking in the sweeping views of the sparkling the Gulf of Thailand from our balcony or terrace. A chilled bottle of champagne will be delivered to our suite. We will make a toast to our romantic honeymoon while taking in the sweeping views of the majestic Gulf of Thailand from our balcony. This is the epitome of romance. 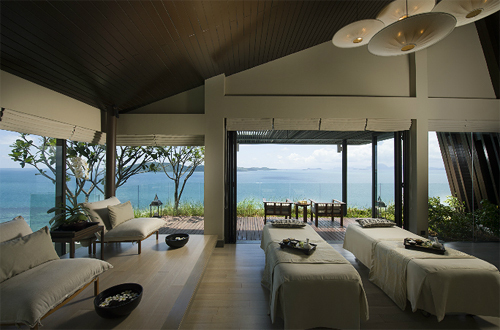 On my honeymoon in Thailand, I will indulge my senses with an exclusive spa package at Conrad Koh Samui. There, I will unwind in the idyllic surroundings of spa and rejuvenate my mind and body with innovated beauty and relaxation treatments, designed to deliver maximum comfort and outstanding results. I will take advantage of complimentary access to the spa facilities, including sauna, whirlpool, and relaxation room. 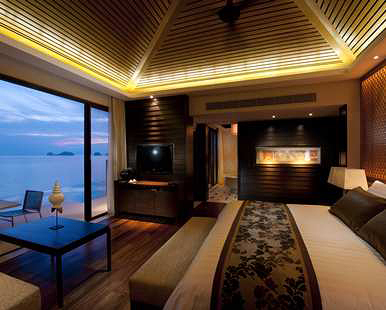 This is bound to make my stay at Conrad Koh Samui even more luxurious. With this spa program, we will recreate an original earthly paradise that is designed specifically for us and is performed in the Royal Treatment Suite. The treatments include: Real Aromatherapy Body Massage, Candlelit Frangipani Bathology, Essential Face, De-stress Muscle Release, Body Massage, Candlelit Frangipani Bathology, and Deep Cleansing Facial. Both of our needs and wants will be met with this wonderful program. Developed in consultation with specialists in Traditional Chinese Medicine, this therapeutic massage works through my abdominal area, which is the center of Chi, and the chest area, to improve my digestion and breathing. Including a head and scalp massage to release cranial tension and improve concentration, this treatment stimulates my lymphatic flow, helping to detoxify my body by getting rid of toxins and negativity and induce a deeper state of relaxation and enjoy a peaceful mind. Chi energy is said to flow via meridian lines in the body. 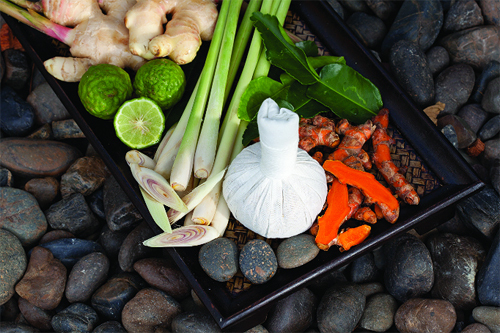 This ancient treatment works with my body’s innate energy to release chi blockages. By tracing meridian lines with various degrees of pressure, my therapist will be able to release stagnation and stimulate my body’s natural ability to heal. Pressing on acupressure points relieves muscle tension, leaving me in a state of inner stillness and calm. Dating back 5,000 years, this traditional, sensory experience using herbal compresses on my body’s energy channels to promote circulation and energy flow. The treatment will relieve muscle tension and toxins with healing herbs and gentle massage. Combined with a meridian massage or on its own, this experience is highly recommended as a simple and effective jet lag treatment. This is a purifying treatment for oily and combination skin. First, I will receive a cleansing and exfoliation then I will receive a steaming, extraction, and a hot towel compress to refine my pores. A freshwater mud mask is then applied to my face to draw out harmful impurities. As relaxing as it is cleansing, this treatment also includes a scalp massage, facial pressure point massage and a hand and arm massage for complete care. I will refresh and brighten my eyes with this revitalizing eye treatment, the perfect addition to any facial. This treatment uses specialized massage techniques to improve micro-circulation and drainage, helping reduce any puffiness. Herbal extracts of toning black tea, cranberry and strawberry delicately firm my skin while working on dark circles and fine lines. I will feel refreshed and ready to take on the day. I will cool over-heated skin with this refreshing and soothing body wrap that combines the healing properties of lavender with cooling peppermint and regenerative rose. Gentle exfoliation prepares my body for an intensive layering of hydrating gel, soothing lavender oil and nourishing body cream rich in shea butter. An Ayurvedic scalp massage will leave me feeling relaxed and restored. This classic treatment contains a lavish tropical manicure Koh Samui style, including sculpting of my cuticles, nail shaping, a relaxing hand and arm massage, exfoliation and a moisture mask, finishing off with a buff and polish. How wonderful. I will treat my feet to a break. My tired feet are soothed and soaked, nails and cuticles are tidied and massaged, and it’s all finished off with a shiny buff and polish. This nourishing foot treatment is just what I need on my honeymoon. We will receive the relaxation and rejuvenation we are longing for with the Conrad Spa Experience. 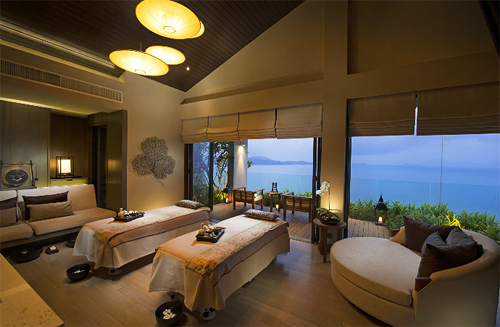 When we stay two or more nights in a premium room at Conrad Koh Samui, we will enjoy 60 minutes of a stimulating and invigorating body polish followed by a back massage incorporating morning during our stay. 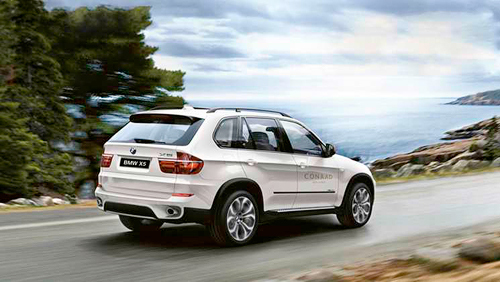 This is luxury at its finest. 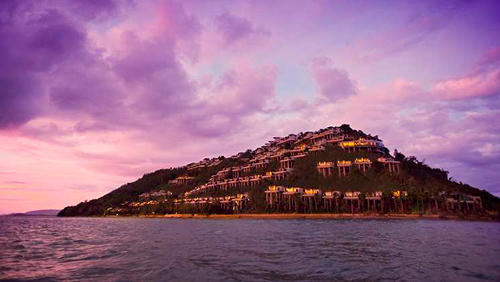 We will celebrate the greatest day of our lives at Conrad Koh Samui on the beautiful island of Sur, Thailand. 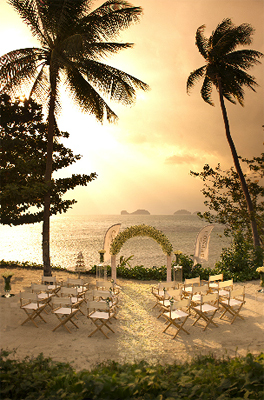 With your generous wedding gift, we will experience a wedding ceremony on a private beach while our family and friends gather to witness our beloved day. Our on-site wedding coordinator will take care of every single detail for our big day from our ceremony to the reception and all guest arrangements. Whether we are planning an elegant event or an intimate wedding, Conrad Koh Samui will ensure that our day is pure perfection.